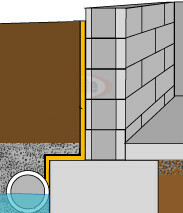 Drainage is a system that carries water downhill. 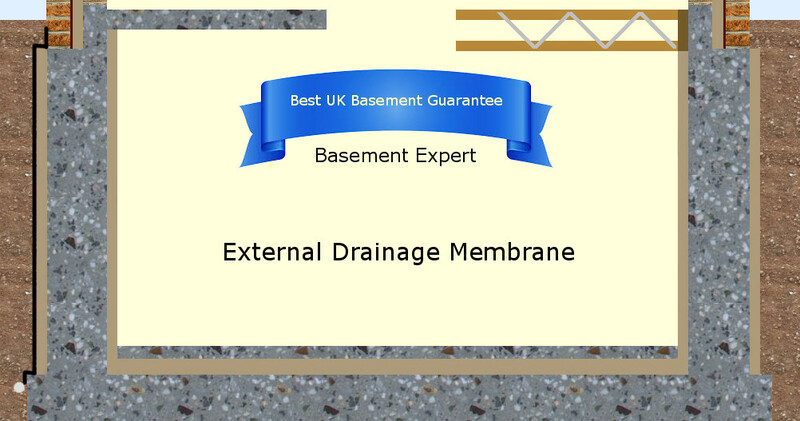 You would want External Basement Drainage to always carry water away from your basement. 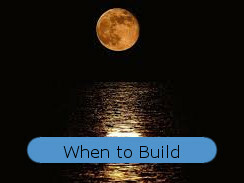 Therefore, you must make sure that wherever water beside your basement goes to, that the soakaway or whatever, will cope even during the worst storm. Otherwise your drainage will fill up and apply water pressure against your basement - which would be worse than not having that drainage. 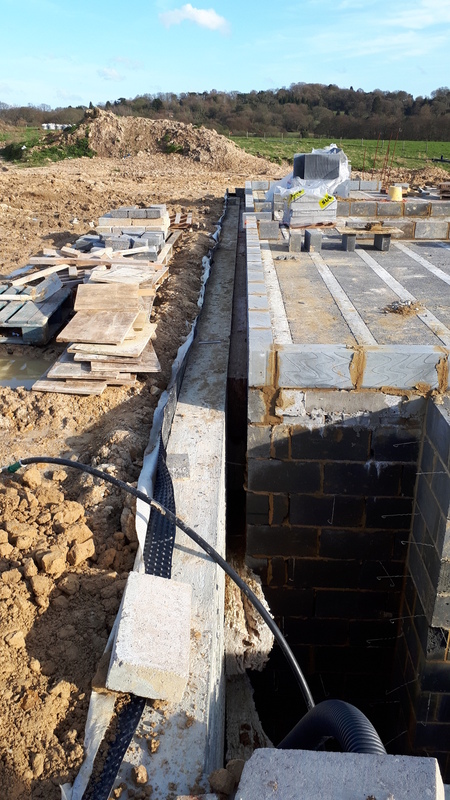 In my experience, external basement drainage was not suitable in the majority of cases because the water would not always drain away fast enough. 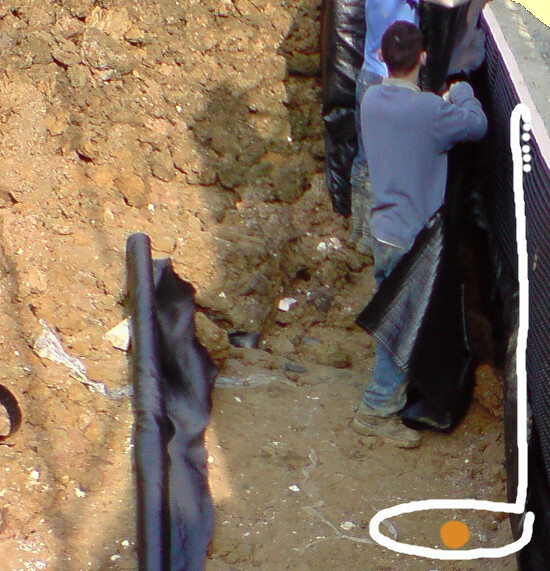 A bobbled drainage board covered in geotextile filter membrane that is not crushed when you backfill. Water drains freely from the drainage board into a pipe. The whole system is protected from silting up. These are photos of the drainage board I have for sale and in stock. I only have the high density plastic drainage board. I don't have the geotextile filter membrane already attached to it because the board does not need to be overlapped whereas the filter must be overlapped. 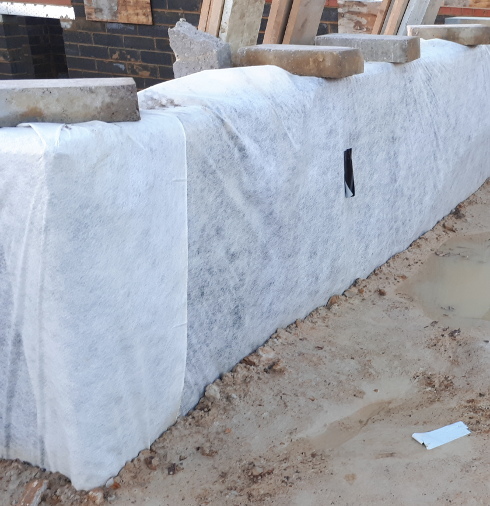 So it is far easier, and more likely to be installed properly if the filter is a wide sheet off a long roll and it comes down the wall and gets wrapped under the pipe as well. Note also that I fold the filter over the top of the board. This is far more effective than the plastic strip others would sell because, firstly, it doesn't go out of shape when backfilling and. secondly, it is easier. 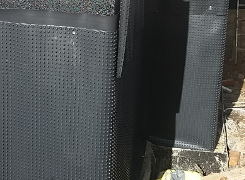 You can buy woven filter membrane such as the black in the top photo and non woven such as the white in these photos. The problem with the woven is that where you overlap two sheets it becomes waterproof and will not let clean water through. So the non woven variety would be better. 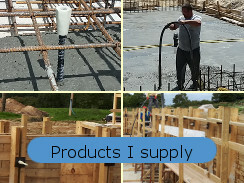 My drainage board comes in rolls 20m long and 1.9m wide. You can see the flat edge for overlaps where you have one board above another. The dimpled width is 1.8m. I sell these for £90 each. I would usually cut them in half before dispatch because full rolls are a bit too heavy. The ends don't need overlapping. The board is not intended to be waterproof, only to provide water its easiest route down. 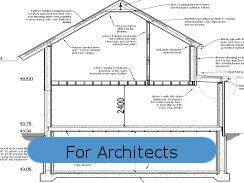 With a bit of planning fitting this can be really easy. 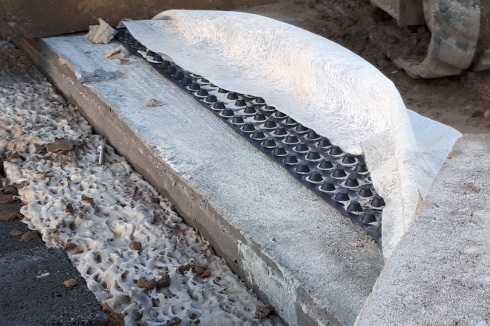 If you simply nail a few little bits of timber against the inside of your formwork you will leave little blocks of wood in your concrete to simply screw board and filter membrane to.